Moving to Houston can mean a lot of choices when it comes to what area of the city one should move to. As large are the Greater Houston area is, there are many different communities to call home. Here is a list of the top 15 suburb areas to consider when moving to Houston. The Woodlands is a relaxed community located Northwest of the Houston area, and is part of Montgomery County. As would seem fitting by its name, The Woodlands is a lush area full of forests, parks, and trails, with communities and businesses hidden just behind the trees. Once an up-and-coming community, The Woodlands has blossomed heavily over the past few years. Major corporations such as ExxonMobil, Anadarko and Chevron Phillips Chemical have made a home for their corporate headquarters in The Woodlands area. With beautiful luxury residential developments and top-notch education options, living in The Woodlands area has become more and more attractive to corporations and their staff. Sugar Land, named for the sugar plantation that was present during the early 20th century, began to evolve back in 1959 when residential housing became part of the landscape allowing for this city to become completely incorporated. The city of Sugar Land has since become one of the most affluent and fastest-growing communities in the state of Texas. Now Sugar Land is home to some of the finest of master-planned communities and has plenty of commerce to boot. Sugar Land is headquarters to Imperial Sugar, and at one point, Imperial’s main sugar refinery was once located within in the city. Sugar Land is also home to the new Smart Financial Center concert hall, and hosts the Sugar Land Skeeters, a minor league baseball team and their very own Constellation Field. Over the years, the quiet and quaint city of Katy, Texas has grown to be one of the largest and most popular areas around the city of Houston to call home. Part of what makes the area of Katy so attractive is the proximity to major employers such as: Igloo, Academy Sports and Outdoors, and the extremely short commute up Interstate 10 to what is known as the Energy Corridor. Besides the vast amount of master-planned communities, such as Cinco Ranch, the community has plenty to offer. Planting roots in Katy, residents can find local attractions such as Typhoon Texas, Katy Mills Mall, even KCAM – Katy Contemporary Arts Museum. The Katy Independent School District is one of the best in Houston, and even ranks high within the state of Texas. Ranked in one of the 100 “Best Places to Live in America” by CNN/Money Magazine, Friendswood is a community located just South of Houston. While it is close enough to make a commute in to the city, it is also merely a short drive away from Galveston Island. The community prides itself on excellent education options for residents, with the primary school districts being Friendswood ISD and Clear Creek ISD. With a nice small-town feel, yet large enough to maintain some of the most upscale, luxury communities in the area, Friendswood accommodates the lifestyle of many. The convenience of close-by shopping and recreation facilities, as well as major employers, make the area a great place to live. Living in the Clear Lake area is ideal for many, but especially for those who enjoy living near the coast, or even having a seaside home. The Clear Lake area is surrounded by bodies of water including: Clear Lake, Taylor Lake, Clear Creek and Galveston Bay. The Clear Lake area also has one of the largest concentrations of recreational boats and marinas in the nation. The industries of the Clear Lake area are tremendously unique to the remainder of Houston, with the predominant industries being aerospace (NASA and Lockheed Martin) and tourism. Home to the Johnson Space Center, and the Kemah Boardwalk, there is plenty to do and learn about when visiting or living in the Clear Lake area. Pearland, Texas has been the third largest and fastest growing city in the Houston MSA since 2000. This is not hard to believe with the close location the city has to the Texas Medical Center, which is easily commuted to by way of Texas 288, otherwise known as the “Nolan Ryan Expressway”. Pearland values academics, and high quality education is a major reason new residents move to Pearland. Most of the community’s public schools earn the state’s exemplary status. With over 60 degree-granting institutions, the people of Pearland have a wealth of higher education options to choose from, including The University of Houston at Pearland. This once small farming community has grown to a robust city with plenty of commerce and up-and-coming master-planned communities. League City is located close to the Clear Lake area and is home to many who work in the Webster, Clear Lake, and even Galveston Island areas, in addition to League City itself. This community was named “Best City in Texas for People Looking for Jobs” by NerdWallet, proving that without a shadow of a doubt, if one is seeking to grow their career, they ought to consider the League City area. Close to Clear Lake, there are a variety of industries including: maritime, aerospace and medical. The University of Texas Medical Branch (UTMB) facility is conveniently located off of Interstate 45. Home to Clear Creek ISD, as well as many fantastic private school options, League City proves to be an ideal place for a family to grow and thrive. This city of Richmond is rising to the top in the same way as the most sought-after communities within the Houston and surrounding areas. What makes Richmond such a fascinating city is that despite its upward climb in growth, the city has maintained much of its history and historical sites for all to enjoy. From the historic Morton Cemetery, the Form Bend Museum, and the County Court House established in 1908, to their large amount of historic homes, this quaint area has managed to bring in growth, while maintaining their valuable history and charm. Spring, Texas has come a long way from the days of just being one of the main thorough-ways of the International and Great Northern Railroad to a city of communities and commerce. Today, Spring ranks as number 15 in Niche’s “Most Diverse Suburbs in Texas”. What is beneficial to living in the Spring area, is the proximity of the Grand Parkway – the Highway 99 Tollway that connects The Woodlands and Spring all the way as far as the Fort Bend area. This ease in commute has brought in many strong headquarters to employ residents, as well as made way for many vivacious master-planned communities spelled out across the many available parcels of land. Though the city is steadily growing, it has not lost sight of its history, with Old Town Spring still being one of their major attractions for local residents, as well as visitors and tourists traveling through. Humble, Texas is located in the Northeastern area of Harris County, covering 10-square miles. Humble has a huge presence of commercial businesses within the city and its outer areas. This has caused the population to dramatically increase. Humble is home to some of the best schools in the area, a large mall, state-of-the-art hospital facilities and its very own civic center and covered civic arena. Attractive for the lush greenery, Humble is also home to many local parks, such as: Hirsch Memorial Park, Uptown Park, Schott Park and Timberwood Park. The city of Humble is also close to Bush Intercontinental Airport, making living near work for IAH employees a very easy feat. Part of what is to be considered the Lake Houston area, the city of Humble participates in supporting surrounding communities in growing the regional economy. Kingwood was founded in 1971 as a joint project between developer Friendswood Development and King Ranch. What makes this community so alluring to people relocating is that it is literally built within the greenbelts. This allows for residents to have easy access to hiking and biking trails, parks and even a boat ramp with access to Lake Houston. The top-rated schools and access to a variety extra-curricular activities within the community, Kingwood offers its residents and families a wealth of opportunities to grow and learn. Not surprisingly, the community of Kingwood has picked up the nickname of “The Livable Forest”. Kingwood was also recently ranked the safest community to live in Houston. The city of Stafford is located in Fort Bend County and is definitely becoming a mainstay community of the Southwest area of Houston. One of the reasons Stafford has found such great success, is that they have a surprisingly large amount of commercial activity. Combining the vigorous commerce and rich development has a monumental effect on their city’s economy. Stafford also has much to brag about in the ways of available entertainment, such as the Stafford Centre Performing Arts Theatre, the Stafford Community Center and the Margaret Havens Historical Memorial Gardens, located next to their city hall. Located of Highway 290 in the Northwest area of Houston, Cypress is certainly a community that is full of growth and thriving communities. Home to some of the best master-planned communities in Houston, such as Towne Lake and Bridgeland, Cypress continues to dominate the area in the ways of suburban growth and amenities for residents. Cypress is served by Cypress-Fairbanks Independent School District, the third-largest school district in the State of Texas, as well as on of the fastest growing in the United States. Companies such as Sysco, Hewlett Packard, and Lone Star College have also made their marks in the community, providing jobs and boosting the economy. Once a farm and ranch community, Fulshear, Texas is making its way to becoming one of the most sought-after areas to live in the Western area of Houston. 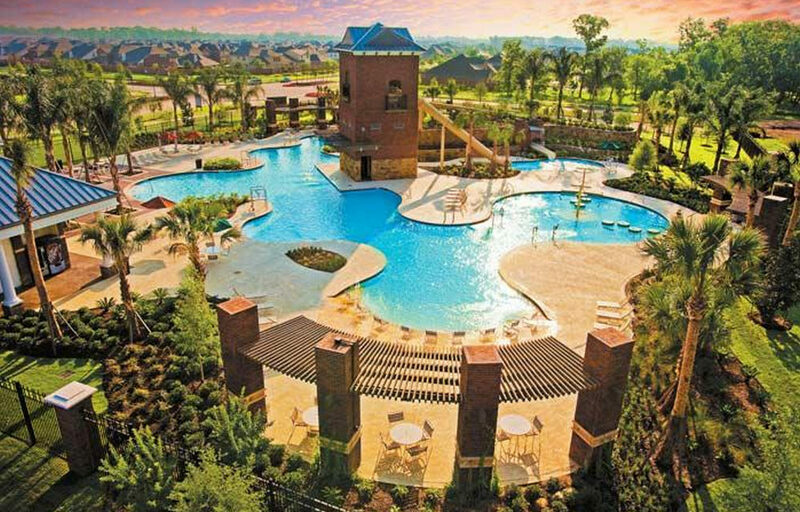 Located just outside of Katy, Fulshear has had plenty of land to welcome incoming master-planned communities such as Cross Creek Ranch and highly acclaimed Harvest Green, who has designed their community around the farming concept. Residents of Fulshear can enjoy a relaxed country lifestyle and the convenience of being just a few miles away from retail, major shopping and dining and plenty of entertainment. Economy is growing in Fulshear, with interstate 10 and the Westpark Tollway being close enough for a commute in. Fulshear was also ranked the fastest growing city in Texas, according to 2016 population estimates. Missouri City is located not too far from the Downtown Houston area, making this community ideal for those who work in the inner loop area, but would like the ease of living in a nice suburban town. Close to many major freeways, the Port of Houston, and just a short drive from Hobby Airport, living in Missouri City is a great place to work and raise a family. Served by the highly recognized Fort Bend Independent School District, and home to several award-winning master-planned communities, living in Missouri City allows for residents to experience a great quality of life.